This sculptural felt beret was handmade by FeltHappiness from Merino wool fiber. A dramatic hat to be worn by an artistic soul. Size: 21 3/4 – 22 1/4 inches (55.24– 56.51 cm). Sculptural felt beret with ruffle, opalescent pastel colors of a soap bubble with the warmth of felt. The colors of this white hat are like mother-of-pearl: the palest green, pink, blue and white with bits of sparkle from iridescent Angelina fibers enmeshed in the wool. A felt ruffle encircles a faceted blue bead and waves across the top. It is truly a beautiful and graceful beret, easily worn by any artistic soul with style. This hat is made of Merino wool fiber which I’ve carefully overlapped like shingles to make a flexible and warm fabric – felt! I shaped the damp felt around my hat block to create this hat’s unique shape. The pale ‘wave’ has been arranged so it undulates gracefully. After the felt dried, I top-stitched the edges and around some of the ‘bubbles’ to give further definition. This hat doesn’t cover the ears, but rests above them. It is a wearable art that can be worn a variety of ways; you can turn the hat so that the focal point is center front, or off to one side. The inside of the hat has a hand sewn headsize band of lavender colored millinery grosgrain. The hat should fit a range of 21 3/4 – 22 1/4 inches (55.24– 56.51 cm). The hat at its widest point on top measures approximately 12 inches (30.48 cm) in length. It is a mid-weight felt in thickness and weighs 2.8 ounces (79 grams). Sheep wool resists dirt and rain excellently! This hat can be gently hand washed in cool water with mild soap. Cool rinse, blot on a towel, shape with a bit of toweling balled up under and air dry. Juliane lives in Gibsonia, Pennsylania, USA. 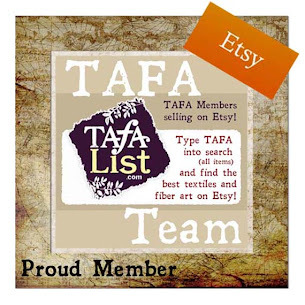 When you purchase the hat, you will receive an email from TAFA introducing you to Juliane. She will pick up the transaction from there and contact you with the shipping cost. As her hats are bulky, it is hard to estimate what shipping prices will be until she knows the destination. She will then bill you separately for that cost. Insurance can be included as an extra charge upon request in the United States.